This was a huge week for Samsung, who held its developer conference in San Francisco and announced a bunch of new things, like a new 360 camera called the 360 Round, aimed at professionals and hoping to fill the gap for those mourning the dearly departed Nokia OZO. It also announced Bixby 2.0, with a goal of turning every device in your home into a smart device. I hope you're ready for your washing machine to tell you how much your clothes shrank, or where that missing sock truly is (I know I am). 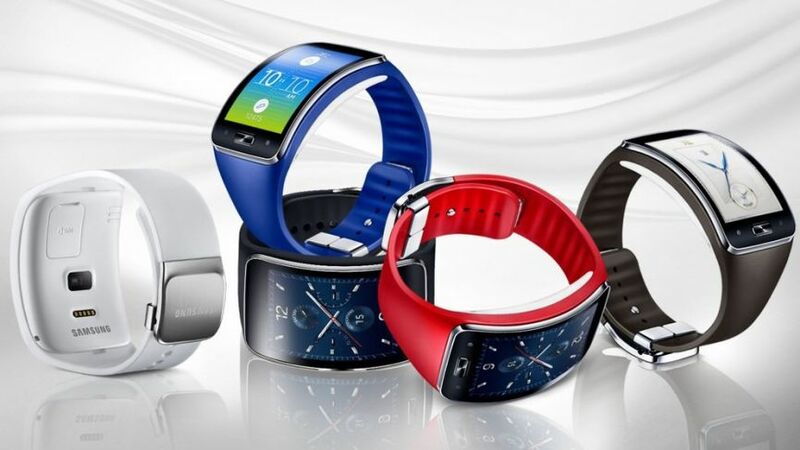 What definitely isn't missing: Samsung's health-packed Simband fitness tracker, which is alive and well. The Korean giant also gave us a sneak peak at its plans in VR, like a standalone headset, and my colleague Hugh got a peak into Samsung's experimental wearable design lab. But that's not all that happened this week. As always, you can head over to our dedicated news section for more. Samsung's 2017 wearables include the Gear Sport and Fit2 Pro, but that of course isn't stopping the company from looking to the future. One thing Samsung has been really interested in for a long time is bendable displays, and Patently Mobile came across a new patent with a wearable bracelet featuring a display that's not only flexible, but bendable. You're not literally wrapping a display around your hand here. Instead, it appears the display curves around an existing strap that does look a lot like a fashionable bracelet. The display can also straighten out and stick out from the strap, giving you a flat and more traditional work surface. As you can see from the image, the display looks like it's running Android, with icons for Chrome, YouTube and Google Photos. That makes it seem like this device could be more of an alternative to the Galaxy phones than the Gear wearables, but we'll have to wait and see. Intel might be ditching health and fitness wearables, but Qualcomm is doubling down. The company already dominates the non-Apple wearable market with its Snapdragon 2100 processor. It's also got its new Snapdragon 1200 processor, aimed at the kid tracker market it thinks is going to explode in the next couple of years. But that's not all. Qualcomm is thinking about chipsets and technology to help power the next round of wearables: smart clothes. Pankaj Kedia, Qualcomm's senior director of product management, tells ZDNet the company is looking toward clothing, shoes, wrist wear, neckwear, and headwear as forming. One of Qualcomm's biggest partners is looking to be Fossil, who just may be the king of Android Wear at the moment. Carnival's wearables for its cruise ships were set to turn its giant ocean liners into smart cities, allowing people to order food, create virtual assistants that can remind them to do things, navigate them around the ship and more. The technology was set to debut this November on the Regal Princess, but now Carnival says that rather than roll out the tech to everyone on board it'll only roll it out to a select number of passengers. Why? It turns out installation of the frameworks backing up such a system is taking a little longer than expected. This week Verizon announced its earnings, and most of it isn't interesting, but what is interesting is that a third of its new customers fell under the "other connected devices" category. This category came in at 238,000 unit sales, led by wearables - usually it was led by Verizon's Hum car tracker. This is compared to net phone additions, which were at 274,000. According to CNBC, this is the first time Verizon has ever mentioned wearables, so it's a great sign the category is gaining steam. One big reason for this success might be Apple Watch Series 3, which has added cellular connectivity. However, it's important to note that Verizon doesn't just sell connected wearables, it also sells things like Fitbit and Garmin devices.